Put the kale leaves into a large bowl. Mix nuts and other ingredients, except kale in blender or food processor to create a “cheese” sauce. Pour over kale then mix and massage covering all of the leafy nooks and crannies. 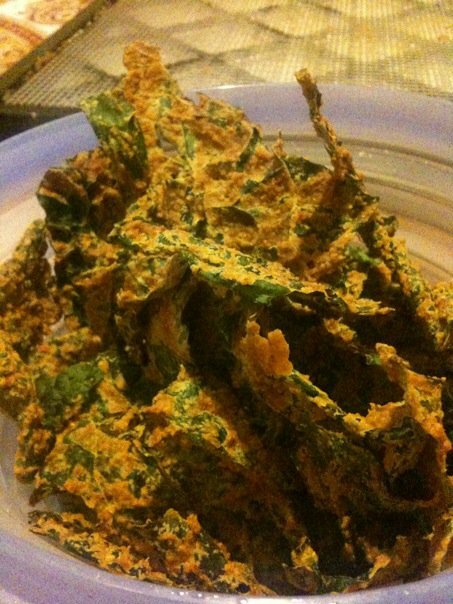 Place pieces of cheezy kale onto dehydrator trays and dehydrate for 8-12 hours (overnight) at 46 degrees ‘til crunchy and moorish. It takes a similar time in a very low oven.